Dr. Blair's Japanese in No Time: The Revolutionary New Language Instruction Method That's Proven to Work! Listen to "Dr. Blair's Japanese in No Time: The Revolutionary New Language Instruction Method That's Proven to Work!" on your iOS and Android device. You've arrived in Japan for a long overdue vacation, when you discover that the amusement park you wanted to visit has been taken over by rebellious fans of a just-cancelled television show. Suddenly, it's up to you to save the park (and worldwide TV broadcasts) from legions of crazed Flower Rangers-and success will depend on your ability to learn enough Japanese to complete your mission ... . Whether you're a businessperson, student, or traveler, whether you're brushing up on a forgotten language or just interested in learning a new one, DR. BLAIR'S JAPANESE IN NO TIME teaches you the skills you need at the pace you want, jump-starting your study with a variety of methods that keep the experience fun, fresh and motivating. Why rely on old, out-dated techniques to learn a new language? 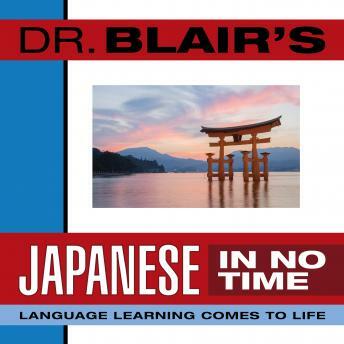 DR. BLAIR'S JAPANESE IN NO TIME offers the up-to-the-minute advantages that you won't hear anywhere else!